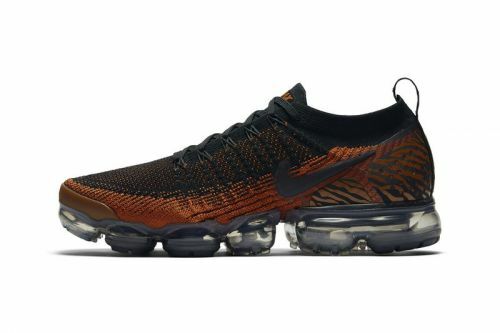 Hot off the heels of "Tiger" and "Zebra" editions, Nike 's Air VaporMax 2.0 now surfaces in a leopard print colorway as part of its upcoming animal-themed pack. This version of the sleek runner features a tonal tan Primeknit upper with an orange ankle collar, a black Swoosh and a leopard print heel counter. All of this sits atop an icy translucent Air VaporMax bubble sole unit with orange accents at the outsole. Additional details include a black and orange heel pull tab and special edition insoles. Following a striking "Zebra" colorway, Nike 's Air VaporMax 2.0 now debuts a tiger stripe edition from its larger animal-themed pack scheduled to release later this Fall.